The Cavs and Warriors are set to square off in Game 3 of The Finals. The Cleveland Cavaliers have won their last eight games at home and came back from a 2-0 deficit in the conference finals. But they're just 6-6 (2-2 in the regular season, 4-4 in The Finals) against the Golden State Warriors at Quicken Loans Arena over the last four years. In these Finals, the crowd and the arena will not win Games 3 and 4 for the Cavs. They must play better, on both ends of the floor, than they did in Games 1 and 2. Here are two things to look for in Game 3 on Wednesday (9 p.m. ET, ABC). Return of the Death Lineup? The Cavs should get a boost by returning home for Game 3, but the Warriors could also get a boost with the return of Andre Iguodala, who has missed the last six games after suffering a bone bruise in his left knee in Game 3 of the Western Conference finals. Iguodala is listed as "questionable" for Game 3 by the Warriors. The Warriors have been at their best in this postseason, outscoring their opponents by 13.6 points per 100 possessions, with Iguodala on the floor. Though it hasn't played together in more than two weeks, the Warriors' lineup of Stephen Curry, Klay Thompson, Iguodala, Kevin Durant and Draymond Green has the best raw plus-minus in the postseason, having outscored opponents by 57 points in its 110 minutes. What factors will prove most crucial in Game 3 of The Finals? The return of Iguodala could mean the return of the Death Lineup (or "Hamptons Five" or whatever you want to call it). Even if Iguodala doesn't return on Wednesday, the Warriors could use their next-best-thing lineup more than they have thus far. The lineup with Shaun Livingston and the Warriors' four All-Stars didn't play at all in regulation of Game 1, but was on the floor for all but the last three seconds of overtime, scoring 15 points on Golden State's first six possessions of the extra period to make Cleveland pay for its late-fourth-quarter mistakes. In the fourth quarter of Game 2, Warriors coach Steve Kerr went back to the Livingston lineup ... for just 32 seconds. The lineup has played just 24 minutes in the entire postseason, all in the six games since Iguodala's injury. Including that 4:57 of overtime in Game 1, the Warriors have played only nine minutes with Green at center (with no other bigs on the floor) over the first two games. They're a plus-15 in those minutes, plus-8 in a little less than five minutes with Kevin Love at center for Cleveland and plus-7 in a little more than four minutes with Tristan Thompson at center for Cleveland. The goal is to get James going downhill against Thompson's defender. 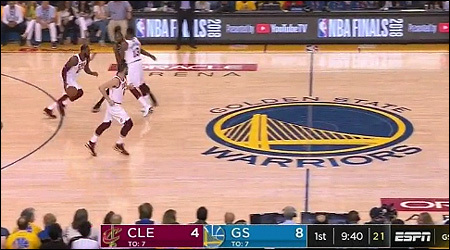 Green picked up James after that screen above, but the Cavs' primary target with these screens is JaVale McGee. And it worked on one second quarter possession where McGee couldn't contain James and tripped him. McGee survived the attack (after James lost control of his dribble) a few minutes later and the results were mixed in Game 2, though the Cavs set less than 10 of these early screens for James on Sunday. Expect to see more in Game 3. Ideally, the Warriors would prefer Durant to avoid the screen and get back in front of James, so McGee isn't put in a tough spot. McGee gives the Warriors some important verticality on offense, but he might not be able to contain James on the other end of the floor. It was in this series last year when McGee's defensive issues kept him from playing in Game 5.